Rogue offers a wide variety of full tube and tube hybrid electronics. From cost effective integrated amplifiers, starting at just $1295, to their flagship Apollo monoblock tube amplifiers at $11k, Rogue likely has a product to satisfy most any audiophile need and budget. Build quality is first rate. The construction quality and fit and finish is impressive both outside and inside - the photos don’t do justice to the products. Internally you’ll find a neat and tidy layout with wire looms properly dressed, high quality boards and component parts. 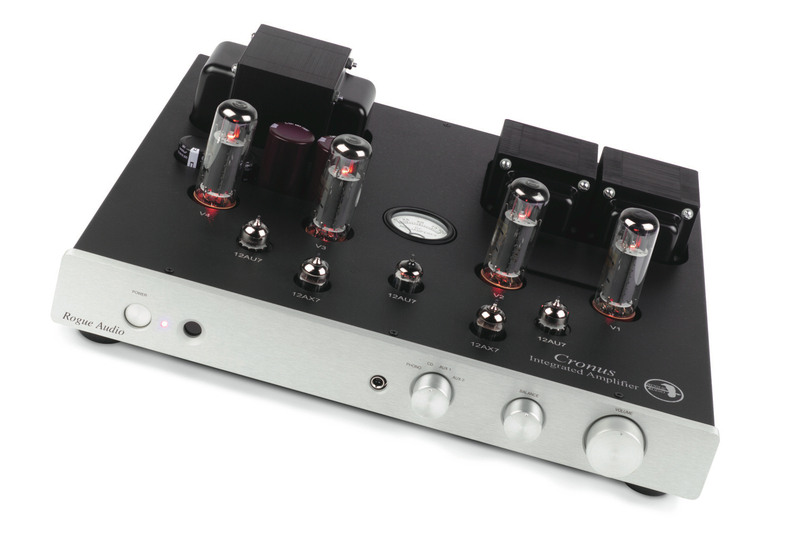 Analog fans will appreciate the fact that all three integrated amp models include a phono input for MM cartridges. The Cronus Magnum is one of the most popular units in the Rogue line. One listen and you’ll know why. 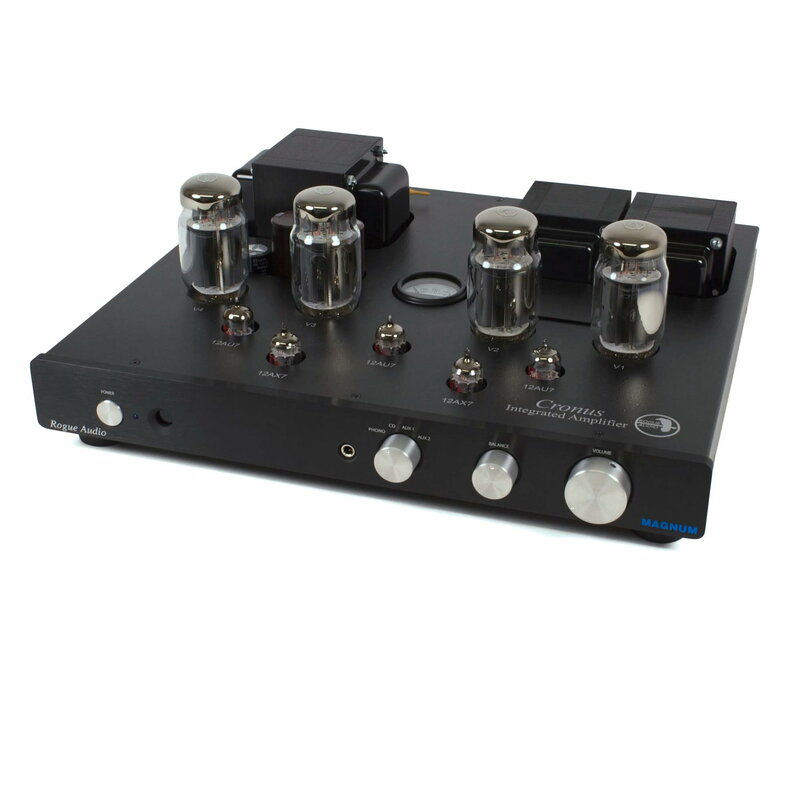 This full tube integrated amplifier offers a remarkable level of performance at this price point and competes with many other products at up to twice its price. You’ll hear the qualities of tubes but without any undue implicit coloration or softening. 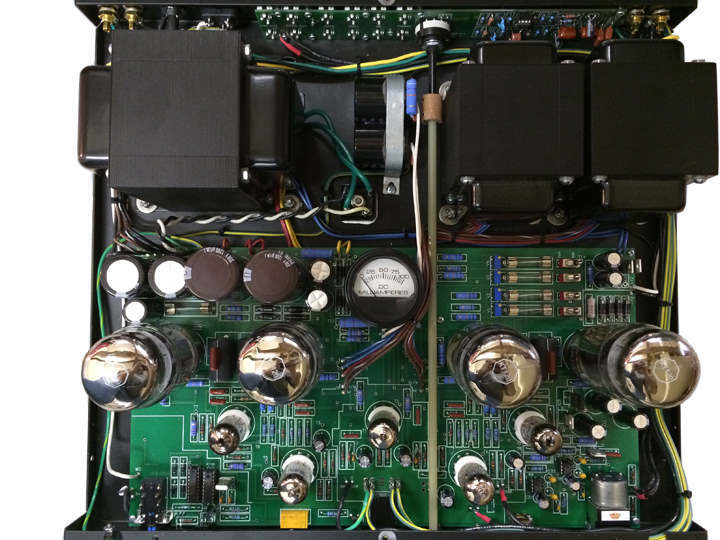 The ever popular full-tube integrated amplifier has undergone a significant upgrade! The Cronus Magnum II was an outstanding product offering amazing performance, great reliability and absolutely remarkable value. So how could Rogue improve on that? Read on. One of the most exciting upgrades is the ability to operate the CM3 in Triode mode. An external switch selects between ultra linear (100WPC) and triode (60WPC) operation allowing the listener to enjoy the qualities and characteristics of each mode without powering down. 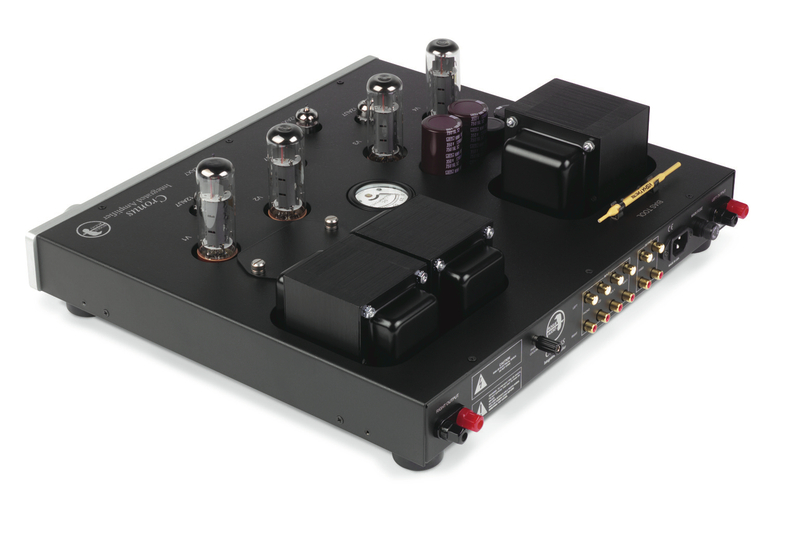 The CM3 also sports a completely new phono section that can now accommodate low output cartridges. It features new ultra-low noise circuitry and now offers user adjustable loading and selectable gain (44 dB or 58 dB). Most importantly, it sounds terrific! The headphone amplifier is also completely new and is a direct derivative of Rogue’s award-winning RH-5 headphone amp. The new design is much more comprehensive and features MOSFET buffers on the outputs. Along with significantly enhanced performance, the powerful new design will drive even the most difficult headphones. The line level circuitry has also been improved and now features a super low noise floor and better overall sonics. Finally, the three-button metal remote is back and included with every unit! 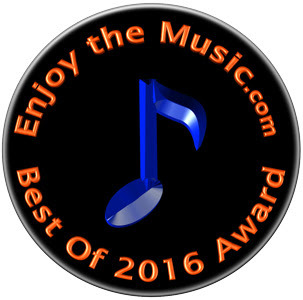 Enjoy The Music: “I genuinely feel the Rogue Audio Cronus Magnum II is far more than simply entry-level high-end audio. For $2495 it is far more capable than expected and can easily drive virtually any speaker and headphone, plus it has a great MM phonostage too! 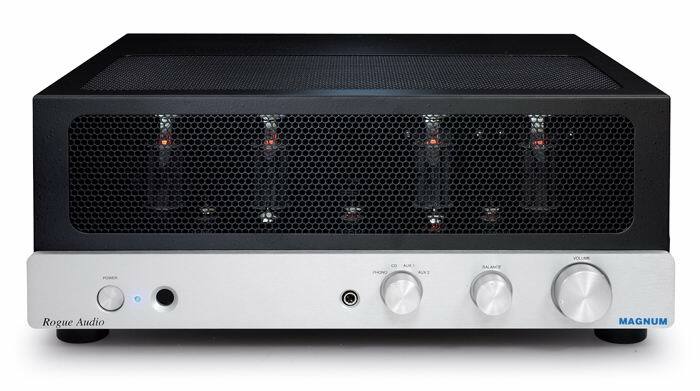 Am still shaking my head in disbelief at how well this glowing tube amplifier performed. Music sounded very natural and authentic to the recording. There is an openness backed by an abundance of drive, if the recording calls for it naturally. The guys at Rogue Audio most definitely tuned this hefty jewel by ear, versus just choosing this or that part off the shelf. “This is my first Rogue Audio product within our home, and without a doubt it is obvious why they have earned many awards. I attribute the Cronus Magnum II's rock solid quality and reliability due to a massively overbuilt design. Sound quality carefully designed in by ear, not by measurements alone. Considering the wide variety of speakers, it had to drive during this review, Rogue Audio's Cronus Magnum II proved to be extremely versatile too! Dare I say it is so flawless in ease of operation that a 15-year-old girl can do it? The Absolute Sound: "As I would hear on a wide range of music, the Cronus strikes a beautiful balance between elegance and power. Its dynamic scaling is very fine—lilting with chamber music, muscular with rock and orchestra. Yet that muscle is sinewy and well defined, bringing a great sense of tunefulness and detail to low-frequency instruments. For instance, on Rhino’s outstanding release of the Grateful Dead’s The Warner Brothers Studio Albums (reviewed in this issue), the Cronus Magnum brought great clarity, instrumental texture, and tonal richness to Phil Lesh’s one-of-a-kind bass lines. Although the Magnum may not carry the sledgehammer-like weight of a hefty solid-state design—a qu ality that has its own rewards—I rather like its more elegantly musical low-frequency delivery. "This musicality extends across the spectrum, as was nicely demonstrated with Ravel’s Piano Concerto in G major—Argerich/Abbado/Berlin Philharmonic [DG Originals CD]. The balance between soloist and orchestra was spot-on, with a lovely lightness and transparency, lively dynamics, swift transients, and a recreation of a soundstage that was a pretty convincing facsimile of, say, orchestra center. "The Magnum is also remarkably transparent to the source, allowing listeners to “peer” into a recorded performance in a way that is highly unusual in this price class. Turning to the playful brilliance of H.K. Gruber’s superbly recorded Frankenstein!! was akin to pulling back the curtain on the session. If you don’t have this Chandos CD, which was listed by Jonathan Valin in last issue’s “Guide To Audiophile Demo Discs,” you really should. It has it all. As channeled through this Rogue integrated this delightful cabaret-style piece of mad fun revealed not only the Cronus Magnum’s transparency, but also its excellent sense of focus, recreation of the air surrounding instruments, as well as Gruber’s own singspiel vocal delivery, dramatic dynamic swings, snap of the percussion, and a soundstage that at times extends well beyond the speakers’ boundaries, with nicely layered depth.